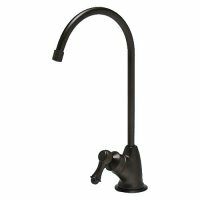 The KleenWater KWDWF-ORB is a elegant faucet made of the highest quality components and conforms with the 2014 Federal Reduction of Lead Drinking Water Act. The oil rubbed bronze finish and European style give it a very attractive appearance. The price is extremely affordable and the quality is beyond reproach. There are no plastic components and it can withstand up to 120 PSI. The dependable ceramic disc valve mechanism is guaranteed to perform and carries a 3 year leak free warranty. This faucet is built to last and is "Lead Free".